I grew up with the original Ghostbusters and have always been a big fan. I have a proton pack from the newer movie and made my own spin on a Ghostbusters costume for conventions that includes a corset with a Ghostbusters logo sewn on. I haven't seen the new Ghostbusters movie yet, but I'm really excited to despite the mixed reviews. 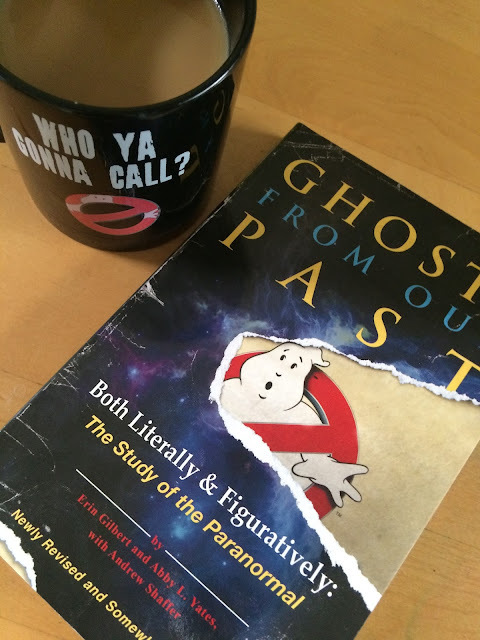 This Ghosts From Our Pasts book is a physical copy of the one they have in the movie, written by the characters Erin Gilbert and Abby Yates. The book is really fun to read and a little humorous, too, with lots of illustrations and many references that fans will notice and enjoy. The book is basically a written as the experiences of both characters through out their childhood and into adulthood with the paranormal and spawned their passion for what they do as 'busters. They go on to write about the science of the existence of ghosts and provide an illustrated guide of the different classifications of the paranormal. There are even a couple sections written by Jillian Hotlzmann and Patty Tolan. There's an "Is it a ghost?' quiz, Supernatural stakeout journal, and many more interesting and fun things in this book, which is something that old fans and new fans alike will and can appreciate even if you didn't particularly care for the new movie. Essentially, the book captures the characters exactly as they are on screen and it's really fun and hilarious to read. I definitely recommend picking it up and giving it a read through. Have you seen the new Ghostbusters movie yet?